Chicago and Suburbs Attractions | A Savings WOW! Chicago is a city filled with lots of fun things to do. Whether you grew up in the city or suburbs like us or plan to visit on your next vacation, check out our list – most of them are free or inexpensive! – Aurora – Blackberry Farm – Illinois residents get free admission on Family Fun Days on May 10, May 24, June 7, June 21, July 6, and August 9. – Aurora – Sci-Tech Museum</a – Free admission for everyone on the first Friday of each month from 6 pm to 8 pm. Children 3 years old and younger are always free. – Chicago – Adler Planetarium – Illinois residents get complimentary general admission on June 5 to 9. Illinois teachers (pre-K through 12) and active military personnel receive free general admission which can be applied to any admission pass. – Chicago – Art Institute of Chicago – Illinois residents get free general admission every Thursday from 5 pm to 8 pm. Admission is always free for children under 14. Admission is free for Chicago teens under the age of 18. Active-duty military and their families receive free admission to the museum from Memorial Day through Labor Day. Current Illinois educators, including pre-K–12 teachers, teaching artists working in schools, and homeschool parents. – Chicago – Chicago Children’s Museum</a – Free admission for all visitors during Target Free Family Nights on Thursdays from 5 pm to 8 pm. Free admission for visitors 15 years old and under on the first Sunday of each month. Veterans and active military receive free admission every day. Teachers, police officers and firefighters receive a discounted admission price of $5.00. – Chicago – Chicago History Museum – Illinois residents get free admission on July 4 and every Tuesday* from 12:30 to 7:30 pm (excluding December 19 and 26). – Chicago – The DuSable Museum of African History – Illinois residents get free admission on Tuesdays. All Military Duty Personnel, all Branches, receive complimentary admission. Children under 5 years old are always free. – Chicago – The Field Museum – Illinois residents receive complimentary basic admission on June 21, 22, and 23. – Chicago – Museum of Contemporary Art – Admission is free for Illinois residents on Tuesdays year round. Admission is free for members of the military, police and fire departments and veterans. – Chicago – Museum of Science and Industry – Illinois residents receive free admission from June 5 to 9, June 12, September 5 to 8, September 11 to 15, September 18 to 22, September 25 to 29, and October 2 to 5. Active duty military, Illinois POWs, Chicago firefighters, Chicago police officers and Illinois teachers (pre-K through 12th grade) receive free admission. – Chicago – The Peggy Notebaert Nature Museum – Thursdays are suggested donation days for Illinois Residents. Children under 3 years old are always free. From Memorial Day to Labor Day, active duty service members and their families can enjoy free admission. – Chicago – Shedd Aquarium – Illinois residents receive free general admission or discounted upgraded admission on June 5, 6, 12, 13, August 28, 29, September 5, 11, 12, 18, 19, 25, 26, October 2, 3, 9, 10, 16, 17, 23, 24, 25, 26, 30, 31, and November 6, 7, 13, 14, 20, 21. Educators from Illinois, Indiana, Michigan and Wisconsin can receive a complimentary Shedd Pass by registering online. Active-duty military personnel, Chicago police officers and firefighters receive a free Shedd Pass with proper ID. Guests who present a valid Bank of America/Merrill Lynch ATM, credit, or debit card, along with photo identification, will receive one free general admission on the first full weekend of every month: May 6-7, June 3-4, July 1-2, August 5-6, September 2-3, October 7-8, November 4-5, and December 2-3. – Glenview – Kohl’s Children’s Museum – Children under 3 are always free. Military receive buy one, get one free admission for their entire party. – Naperville – DuPage Children’s Museum – Free admission for children under 1 year old. – Naperville – Naper Settlement – Free admission for children under 4 years old. Naperville residents get free admission with proof of residency. Active duty military personnel and their families are eligible for free admission to Naper Settlement between Memorial Day and Labor Day. – Rockford – Discovery Center Museum – Free admission for children 1 year old and younger. – West Chicago – Cascade Drive-In – Children under 5 years old and pets are admitted free. – Everywhere – Marcus Theatres – Two free passes to Kids Dream movies. – Chicago – White Sox Kids Club – Sign up for a free 2017 Kids Club Slugger Membership and receive a voucher to get two free Upper Reserved game tickets to one of select White Sox game dates. – Schaumburg – Schaumburg Boomers – There is a Family Sunday Deal where you’ll receive 4 tickets, 4 hot dogs, and 4 sodas for only $44. – Aurora – Splash Country Water Park – Free admission for hildren under 2 years old. There are Twilight discount admissions. – Des Plaines – Mystic Waters Family Aquatic Center – Free admission for children 2 years old and younger. – Gurnee – Key Lime Cove – There are many special packages, which include waterpark admission. – Rockford – Magic Waters Waterpark – Free admission for children under 1 year old. Tuesdays all admissions are $12. – Yorkville – Raging Waves – Free admission for children 2 years old and under. – Aurora – Phillips Park – Always free admission. – Brookfield – Brookfield Zoo – Free admission for children under 3 years old. Free admission for all active, reservist, and retired members of the military. – Chicago – Lincoln Park Zoo – Always free admission. – Wheaton – Cosley Zoo – Free admission for children 17 years old and younger. Free admission with a Wheaton Park District Universal Resident ID. 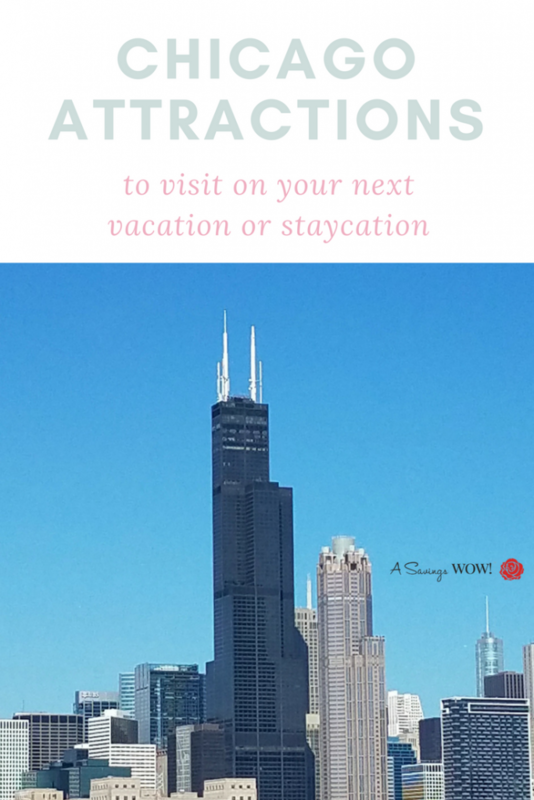 * We’ll continue to add more to this list as we find more events and attractions in the Chicago-area to help you have a wonderful vacation or staycation! Check back often for our updates. Leave a comment for us if you have any ideas on what to add to our list. Lots of fun things for you to do with the kids!